Dave Kikoski was born in Milltown, NJ in 1961. Growing up within a musical family, when Dave turned the age of six, he was introduced to the piano and given lessons for the first time by his father. 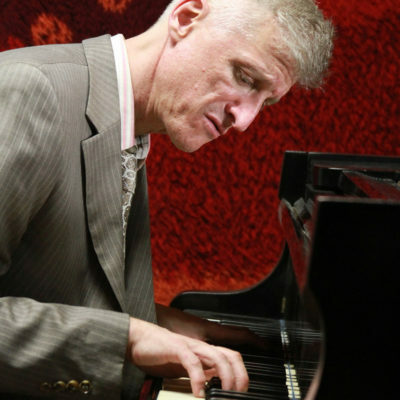 Throughout middle and high school, Dave continued to cultivate his love for piano and moved on to working with various jazz and rock groups around town. During this time, Dave also went on to win the New Jersey Allstate Jazz Competition. After high school, Dave was accepted to the prestigious Berklee College of Music in Boston where he earned a bachelor’s degree in piano performance. While in Boston, Dave began meeting other great players such as Pat Matheny who sat in with Dave’s trio. (Later in 1994, Dave and Pat would meet up again and record together on Roy Haynes’ album, “Te-Vou”, which also featured Christian McBride and Donald Harrison). In 1984, after graduating Berklee, Dave decided to make the move to New York City. There, it didn’t take long for Dave to start making a name for himself and he began playing regularly with renowned players such as Roy Haynes, Bob Berg, Red Rodney, Randy Brecker, and many others. Just two years after his move, Dave landed his first professional recording session in 1986 on Randy Brecker’s album, “In the Idiom”. The album featured him in great company with Joe Henderson, Ron Carter and Al Foster. In 1989, Dave began recording his first album entitled, “Presage”. The album featured a high-octane trio with Eddie Gomez and Al Foster. After being well received, he began his second recording entitled, “Persistent Dreams”. This album was produced by Walter Becker of Steely Dan and featured a larger ensemble including the likes of Randy Brecker and Billy Hart. During the 90’s, Dave’s growing distinction as world class pianist allowed him to work and record as a leader. He was also distinguished as an invaluable “go-to” sideman and was offered places alongside an enviable cast of jazz luminaries such as John Scofield, Ravi Coltrane, Chris Potter, Dave Holland, Mike Stern, Chick Corea, Bill Stewart, Toots Thielemans, Tom Harrell, Gary Thomas, Marcus Miller, Michael Brecker, Pat Martino, Jack Dejohnette, Toninho Horta and many others. In 1994, Dave recorded the self-titled album, “Dave Kikoski” under the Sony Epicure Label; a trio set that found the pianist in the company of bassist Essiet Essiet and Al Foster. Dave further documented his artistic growth in a series of releases for the Dutch label, “CrissCross”. Through CrissCross, In 1998, Dave released “The Maze” featuring Jeff “Tain” Watts, Seamus Blake and Scott Colley. Jazz Writer, David R.Adler, described the release as “A technical and compositional tour de force, this album is one of the undiscovered gems of the 1990’s.” His next release in 1999, “Almost Twilight”, was recorded after a week of trio gigs at Sweet Basil with John Patitucci and Jeff “Tain” Watts. In 2001, Roy Haynes invited Dave to join his all-star lineup including Dave Holland, Roy Hardgrove and Kenny Garrett to record and tour. Their band, “Birds of a Feather”, went on tour extensively with Christian McBride and Nicholas Payton. Birds of a Feather received a Grammy nomination for their album, “Caribbean Jazz Project”, in 2004. Another project produced and arranged by Dave and percussionist Brian Melvin entitled “Beatlejazz” has released four albums so far. Each album reached the top ten on the Gavin radio charts. Beatlejazz has toured extensively in Korea, Japan, Europe as well as the United States and included many special guest appearances during their performances such as Michael & Randy Brecker, Joe Lavano, John Scofield, Mike Stern, Toots Thielemans, Larry Grenadier and others. In 2002, Dave toured with his own Quintet in Japan and Russia. They recorded two albums for the DIW label and also toured with the Brecker Brothers Acoustic Band. In 2004 and 2005, Dave played alongside with Randy Brecker and Bill Evans Soul Bop Band. The group played summer festivals in Europe which ended up turning into a live DVD release. In 2009, Dave played in Europe with the Roy Haynes Quartet and in a trio with Roy Haynes and John Patitucci. In 2011, Dave started performing at the Jazz Standard with Jeff “Tain” Watts performing music from Jeff’s upcoming album. Later that year, Dave Performed on “the Jazz Cruize” with The Randy Brecker Band. In 2012, Dave released another trio album entitled, “Consequences”, featuring Jeff “Tain” Watts and Christian McBride. In 2013, Dave’s quartet live album, “From the Hip”, from BFM Jazz reached number five on the US Jazz Charts. Dave’s most recent CrissCross release is from a collective named “Opus Five”. Opus Five features new originals by bandmates Seamus Blake, Donald Edwards, Alex Sipiagen and Boris Kozlov. In addition to Opus Five, Dave played on the Mingus Big Band album, “Live at the Jazz Standard”, which won the 2011 Grammy Award for Best Large Jazz Ensemble. In 2015, Dave reunited with Roy Haynes and returned to Blue Note. Currently Dave is continuing to tour the world as both a leader in his own projects as well being a featured sideman among various groups. Dave Kikoski has played on over 100 records including 14 under his own name. He continues to foster his individualistic voice while exploring a wide variety of opportunities as both a leader and sideman. Dave seeks to continue composing not only for his own groups but for films and other artistic mediums. As an affecting modernist, Dave distills the best in jazz and popular music and infuses every song with attention-garnering brilliance.